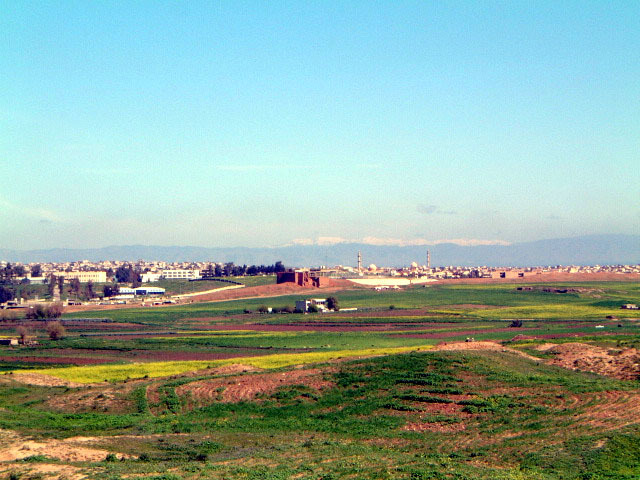 The Plains of Nineveh, Iraq. Operation Tammuz will be the largest humanitarian effort conducted by Assyrians of various backgrounds for the revitalization of the Assyrian ancestral lands in Iraq. The fall of Saddam Hussein marked a turning point for the Assyrians. It meant the end of totalitarian oppression of our people in Iraq and the beginning of life within a free and democratic society, even if predominantly dominated by the non-Christian Arabs and Kurds. To end tyranny and to bring hope to our beleaguered people were the reasons many of us supported the U.S. and British-led invasion of Mesopotamia last year, precisely 2615 years after the fall of the city of Nineveh, the capital of the Assyrian empire. Seventeen months after the collapse of the Baathist regime in Iraq, the U.S. and the Coalition Forces are trapped in a predicament experienced by every non-Middle Eastern invader before them – how to quickly and peacefully unite every social stratum of the Mesopotamian cultures and form a Hellenistic existence in the land of the Twin Rivers. And yet the previous conquerors from Alexander the Great to Cyrus the Great, Trajan to Tamerlane, and even the British in the 20th Century faced less pressure from home and the entire world to bring back their invading forces from Bet-Nahrain than now does George W. Bush in Washington. Several factors may prompt Washington’s decision to pull back the American troops from Iraq, but sadly the one most effectual is the continuous violence in the streets of Baghdad, Mosul, and other major cities in Iraq. As more American soldiers return home in body bags, there will be greater domestic pressure on Washington to end its presence in Iraq. It is precisely for this same reason that most other conquerors of Bet-Nahrain ended their military campaigns, leaving behind chaos and bloody massacres. The Assyrians of Iraq will be facing another series of massacres in the hands of the Kurds and Arabs in their own homeland, should the U.S. troops pull out of Iraq when security and military defense are almost non-existent. Three weeks ago a dozen Chaldean and Syriac Assyrians were killed while worshipping inside 5 churches in Baghdad and Mosul. Over 40,000 Chaldo-Assyrians, according to the Ministry of Immigration and Displacement, have already left Iraq. At this rate, within twenty months from today every Assyrian (Chaldean and Syriac) will have emigrated from Iraq and after 6700 years of continued existence this land will forever be occupied by inhabitants other than its original Mesopotamian landowners. Our Assyrian political and religious leaders in Iraq and in the Diaspora have a tough decision to make: should they support the mass exodus of the Assyrians from Iraq to save their lives or must every man, woman and child be openly asked to stay and face the consequences? Let it be known to all indolent skeptics among us that the 40,000 fleeing Assyrians had already left Iraq some 12 years ago. Be prepared to witness thousands of other Chaldo-Assyrians parting from their native lands in the next few months, but the remaining million or more Christians will not leave their homes and villages, without a real fight. This is how it has always been from the first Hittite or Macedonian invasion of the Assyrian homelands until today’s undersized but steady violence committed by the Kurdish groups in North Iraq. It is the duty of every Assyrian in the Diaspora to support any means in accordance to the proclamations of the U.N. Declaration of the Human Rights to preserve the political, religious, cultural, and human rights of the Chaldo-Assyrians in Iraq. They must be assisted to remain in their homeland by providing them a safe haven, an administrative unit as noted in the Transitional Administrative Law’s Article 53D. This safe haven will include the towns and villages around Mosul in the Nineveh Plains. This assistance will include securing funding from the western governments to rebuild Iraq and their protection of the Chaldo-Assyrians from any future ethnic cleansing. Our people must also be assisted in bringing back our refugees to re-settle in our villages in Iraq. Hence, a major internal operation is required to rebuild our villages, schools, churches; construct clinics, businesses, banks, libraries, and form a strong social infrastructure within a Chaldo-Assyrian administrative unit shielded by the Coalition Forces. Reconstruction of the Chaldo-Assyrian villages in Iraq and building a viable social infrastructure for the Aramaic Christian inhabitants of that country are the aims of a giant effort introduced in our February 16th issue. We called this Operation Tammuz. Operation Tammuz is a careful coordination of several hundreds – possibly thousands - of individuals and groups around the world to provide professional and humanitarian assistance to the Chaldo-Assyrian of Iraq. Operation Tammuz is about supporting the Chaldo-Assyrians of Iraq achieving a prosperous and stable administrative unit in the Nineveh plains. It is also about ensuring the peace and stability in other Iraqi villages and cities where Chaldo-Assyrians reside. Operation Tammuz will consist of activists, legal professionals, the youth and college students, public relations and media professionals, computer programmers, and so on. Every trade and profession will be needed in this first-of-its-kind global effort to avert a humanitarian crisis in Iraq. This project is critically needed as we witness the early signs of reprisals and ethnic violence against the Aramaic Christians of Iraq. We must now quickly respond to assure urgent assistance and services to our people in the Middle East. Because of its extensive reach within our communities around the world, Zinda Magazine has agreed to supervise the recruitment of hundreds of individuals and groups between August 27 and October 1, 2004 who will help the Chaldo-Assyrians of Iraq in taking charge of their own affairs. In the next few weeks, tens of community action groups and grassroots efforts will be organized around the world and hundreds of individuals – like yourself – will be asked to contribute to the greatest challenge facing the Assyrian nation today. With your support Operation Tammuz will initiate hundreds of projects inside and outside of Iraq prior to the January 2005 elections. Next week, the organizational structure of Operation Tammuz will be explained and its mechanisms of operation outlined. Next Friday, you will be asked to enlist as a member of Operation Tammuz to serve your nation and restore its faith in future in the most dire hours of its struggle against injustice. History shows that Assyrians have always maintained a constructive presence in Iraq and the Middle East in general. The Chaldo-Assyrians of Iraq and the Assyrians in the neighboring region wish to live in peace with their Moslem neighbors. Your support and participation in Operation Tammuz, serving along with hundreds of other dedicated men and women, will help make this a possibility. 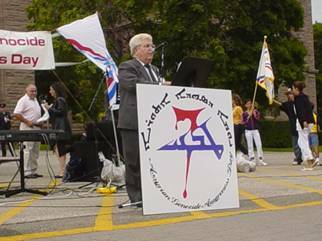 The idea to unite the numerous Assyrian organizations in Canada for the Seventh of August commemoration of our martyrs had its origins in the Kha B’Nisan celebration in Toronto months earlier. Given the success of the New Years event, a number of youths took the initiative and began contacting a number of Assyrian organizations in Canada to unite and plan an event like no other. The goals would differ from past years’ events. In this year’s commemoration, the goal would be to educate about the Assyrian genocides. The target audience would be not only our own Assyrian people, but rather genocide awareness would be brought to the general Canadian public as well. Following the contact of the major Canadian organizations, primarily in the Toronto , Mississauga , and Hamilton , meetings were arranged at the Assyrian Society of Canada in Mississauga . The invitation was made to all organizations willing to work for the cause, irrelevant of political stance, name, tribe or Church sect. It appeared that this might serve as an obstacle in future meetings. The first sign of such difficulty came about when a motion was proposed to disallow any organization not working under the Assyrian name, meaning any group operating under the name of a tribe instead of the nationality was not to receive an invitation to attend the meetings. This motion however, was struck down unanimously by the members of the council for the reason that any organizations working for the Assyrian people should be allowed to join. Assyrian Society of Canada . Assyrian Aid Society of Canada (AAS). Assyrian Democratic Organization ( ADO ). Council for Assyrian Research and Development (CARD). Assyrian Canadian Students Union (ACSU). Nineveh Club of Hamilton . 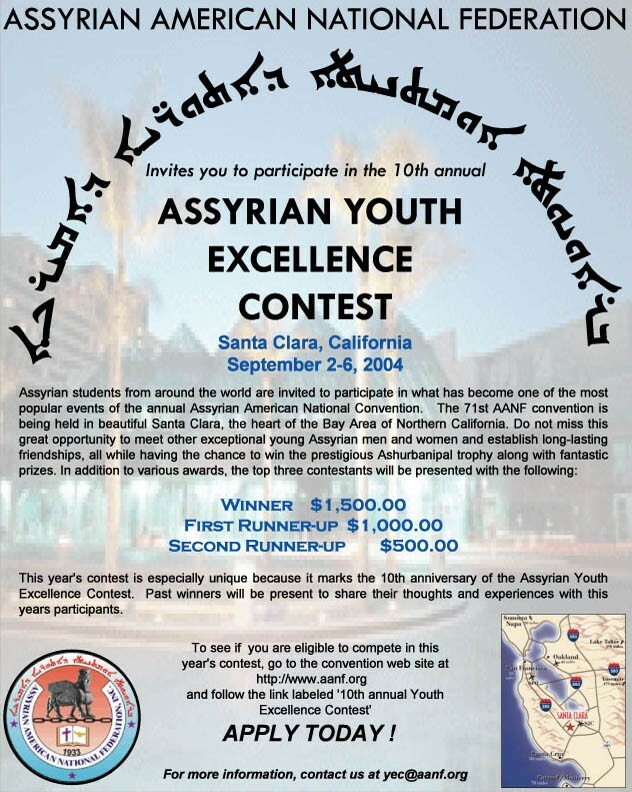 Assyrian Youth Cultural Society of Canada . Assyrian Cultural Association and Administration of Ontario . Two organizations were not present during these meetings and did not add their organization names to the UAOC. These were the Assyrian Canadian Lobbying Committee (ACLC) and the United Assyrian Youth of Canada (Alaymeh). Their reasons for not joining in the efforts of the UAOC were not clear; it is presumed that one reason was that these two organizations disagree with the Chaldo-Assyrian name promoted by several organizations within the UAOC. 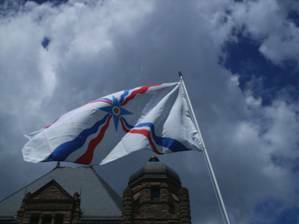 On the other hand, it was agreed that each organization’s personal agenda would not be pushed during the Assyrian Genocide Awareness Day (August 7 th) meetings. Unfortunately, this was not communicated effectively to the other groups which led to some confusion among them. 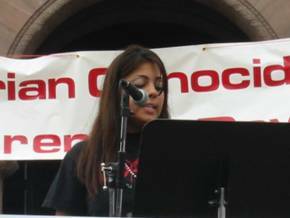 It is worth mentioning that ACLC and Alaymeh had also planned a separate event to commemorate the genocides of 1914-18 as well as the Semele Massacres. The UAOC now had a clear goal and thirteen organizations working towards the accomplishment of three objectives. But, where should the event take place? At first, Nathan Philips Square in downtown Toronto was suggested but it was unavailable. 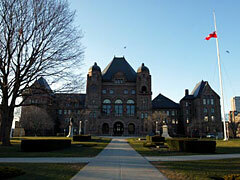 Days later, the Queens Park Provincial Legislative Building was found to be available. All participants agreed that the Assyrian Genocide Awareness Day was to take place on Saturday, August 7 th at this venue. Several more meetings were held to discuss transportation, signs, special invitations, and more importantly the program. At this point a strong youth initiative was involved in planning the details of this event. The youth were comprised of both representatives from several organizations working under the UAOC name as well as dedicated volunteers from the community. These dedicated volunteers were involved with speech-writing, moderating, writing poems, constructing signs and myriad other tasks, large and small. It was now clear that an official logo should be selected in order to advertise the rally to the masses. 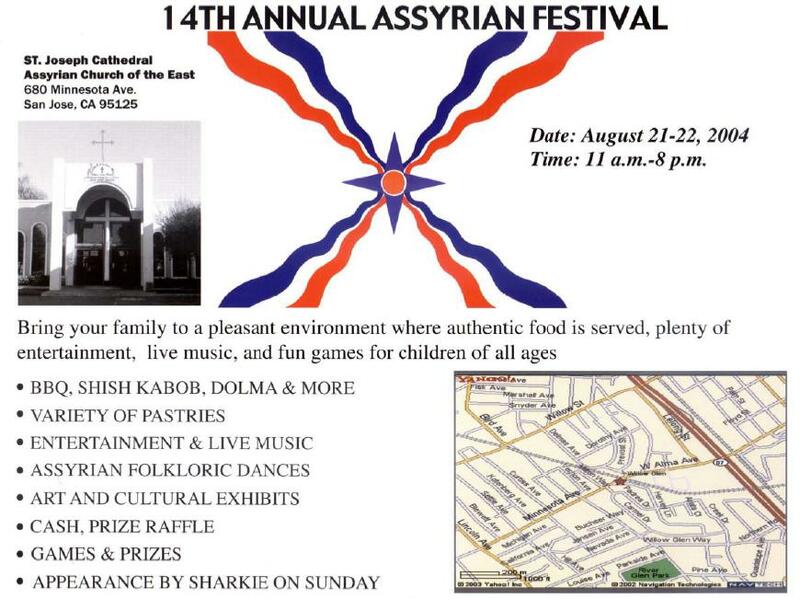 The council wanted to utilize the gifts of the Assyrian community and it was announced that any Assyrian artists who wished to submit a work of art would have their piece displayed at an Assyrian picnic. At this picnic, the following logo [to the right] was selected for its simplicity, elegance and sense of power conveyed. It was created by Ramsin Shliemon. All artists submitting their work were also given honourable mention. A suggestion agreed upon during one of the meetings was to send out a personal invitation to all the heads of the Assyrian Church sects. These included: the Assyrian Church of the East, the Chaldean Catholic Church, and the Syriac Orthodox Church. We received a response from His Holiness Mar Emmanuel of the ACOE as well as an invitation to meet with him and discuss the matter in greater detail. It was decided that a youth delegation would be sent to meet with His Holiness. During the meeting at his residence, His Eminence agreed for a reverend to be sent to say a prayer the day of the event. However, he was very cautious about formally affiliating the name of the church with the rally. He explained that Church and State were two separate entities and that it is difficult for a church to be a part organizer of an event of political nature. The Syriac Orthodox Church was also unable to affix its name officially to the rally but said that the members of the church were free to participate in any way that pleases them. The Chaldean Catholic Church has yet to reply to our request to meet. 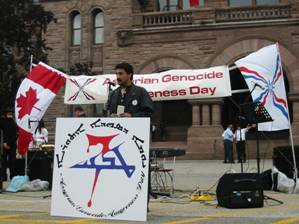 When the council agreed the official name of the rally would be the Assyrian Genocide Awareness Day, a number of concerns were raised by a few parties within the UAOC, led by the Assyrian Democratic Movement (Zowaa). It was explained that a more inclusive name was in fact Chaldo-Assyrian. This suggestion received mixed reactions from many members of the UAOC council. 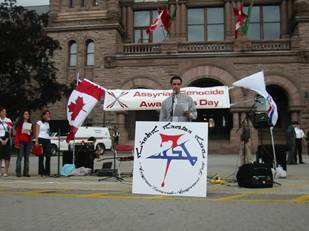 Firstly, it was agreed that the name of the rally would remain the Assyrian Genocide Awareness Day with a subtext underneath stating “also known as Chaldeans.” However, several weeks later this name issue emerged once again due to some printing difficulties. It was apparent that this had to be settled once and for all. Every voting member of the council who wished to voice their opinion was given a chance to do so. A number of arguments were proposed from both sides of the debate. On the one hand, some believed that not all people identify themselves as Assyrian and thus we would be excluding certain members of the nation. On the other hand, some argued that matters affecting us in Iraq should not be brought into the agendas of those working outside Iraq . Others argued that having a subtext such as “also known as Chaldeans” could confuse the public and possibly give the impression that both Chaldean and Assyrian are distinct ethnicities. This could dismiss the fact that the Chaldean name simply refers to the Church sect. A suggestion made was to also include “Nestorians and Syriacs” so as to make it clear that these names refer merely to the different church denominations the Assyrians belong to. In the end, a compromise was not reached and it was decided that the entire “also known as…” subtext was to be pulled from the main display banner. It was decided that this matter should be dropped so as not to create further conflicts in the future and to ensure that time and resources in preparation for August 7 th were utilised more effectively. 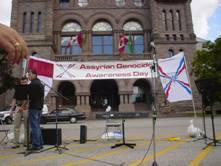 After months of preparation, the Assyrian Genocide Awareness Day Rally was about to commence. 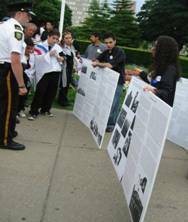 The rally was advertised through various means including: flyer distribution, radio stations, Satellite TV, and friendly reminders during picnics in which a poster campaign took place to remind people of the horrors which have befallen the Assyrian nation throughout the ages. The buses started arriving around 12:25 pm , Assyrian flags draped out of windows, greeting the wind. On an overcast August 7 th, people were slowly arriving to commemorate our Martyrs. Six busloads of proud Assyrians gathered to support for the cause. 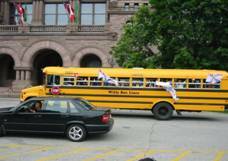 A welcoming committee was present after the arrival of each bus to brief the guests on Queen’s Park rules, washroom policies, and the location of the information boards and movie tent. 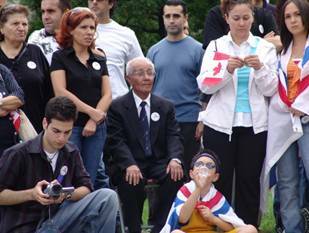 The groups of individuals were then directed to the park which hung the Canadian flag on the left and the Assyrian flag on the right. In between these two, there flew a large banner proudly displaying the title of the event: Assyrian Genocide Awareness Day. At 2:15 sharp, the Masters of Ceremonies Isaac Shlemon and Rania Benjamen, speaking in Assyrian and English respectively, began the program for the seventh of August. Reverend Yousip Sarmas was called upon to say a prayer for all the fallen martyrs. He began with the Lord’s Prayer in Aramaic followed by a prayer specifically for “souls of the thousands of Assyrians who were murdered in the past and to [the] many who are oppressed, persecuted and murdered today.” After the prayer, all were asked to stand and a moment of silence was held in remembrance. 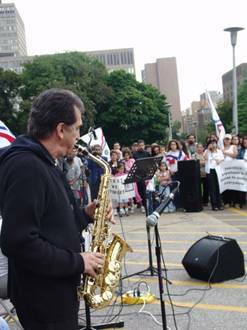 The talented Canadian Assyrian saxophonist Johnson ”Sax” Aghajan culminated the moment of silence with his rendition of Dr. Freydun Atouraya’s famous piece, “Nishra D’Tkhouma”. The soothing sounds of the saxophone, arranged with guitar, strings and piano sent shivers down many spines. This definitely set the mood for the upcoming program. Mr. Aneki Nissan was then called upon to speak about Assyrians and the atrocities that they suffered in the Seyfo campaigns of 1915, the Assyrian Incident of 1933 in Semele and during the Anfal campaigns of 1988. Aneki was one member of many young adults who participated in this rally and worked hard to make it a huge success. Aneki opened his speech with the recital of the United Nations definition of genocide. He then recounted a brief history of the Assyrians of antiquity and pressed on to discuss the specific massacres committed during the Seyfo, Semele, and Anfal campaigns. Following Aneki Nissan’s speech, Mr. Ninib Toma was called upon to recite his personal poem on Semele in Assyrian. Ninib delivered a very moving performance. He began by making special reference to the families of past martyrs who were present at the rally. Ninib Toma himself is a brother to the Assyrian martyr Yousip Toma Hermes. Thus, this rally certainly held a very special meaning to him. At times, as I gazed into the crowd I could identify a number of guests in tears. The UAOC could not have been more excited to hear that the singer Shlimon Bet-Shmuel chose to participate in the August 7 th event. Upon arriving from Chicago , he was very involved in the planning process of the rally. This was evident by his attendance at the latter meetings and music rehearsals. Shlimon Bet-Shmuel most widely known for his song “Semele” was to perform his masterpiece with the sounds of guitar, digital piano, violin, and flute. Near the end of his song, two young adults joined him and sang the chorus alongside him. Following Semele, the band began playing “Orkha D’Ninveh” (Road to Nineveh ) and members of the audience began singing along with Shlimon. His performance truly added a nostalgic touch to the event. Among the honoured guests on the seventh of August was Mr. Hermiz Abouna. It was pleasure to have an esteemed academic join us for this event. Hermiz Abouna gave a more detailed account of the numerous massacres inflicted upon the Assyrian nation. He focused not only on the massacres of the Great War, Semele, and Anfal Campaigns but ventured even further back in history and described the atrocities committed by Tamerlane among many others. Ms. Nora Isak was just one of the many volunteers who had sacrificed many nights to help make this rally as successful as it was. She had offered to write numerous poems in the English language for the purpose of the rally. Her poems were effective and for this reason they were chosen to be presented at this year’s rally. After a 10-minute pause, Mr. Shlimon Bet-Shmuel was then called upon to read his beautiful poem on Semele, Kalu D’Sahdoota. His poem was both memorable and patriotic and it was an added pleasure to have him not only sing but also to add more of his artistic talent to the program. Nora Isak was again asked to recite another one of her poems in English. She delivered another good performance and received a round of applause from the crowd. At this point the rally had attracted a television crew from Toronto ’s City Pulse 24. There was a growing feeling of worry among the organisers because the content of the program since the arrival of the TV crew had been in the Assyrian language and unfortunately other than poems in English, a clear picture was not yet painted to be displayed on the media. Mr. Yakdan Nisan (right) and Mr. Ashur Qoryaqos (left) were the last speakers of the day. Both were asked to recite their respective poems in Assyrian. 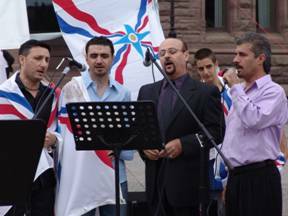 Yakdan Nisan’s poem was originally meant to be a song, which was to be sung by local Assyrian singers in Canada . However, due to some difficulties the song was transformed into a poem and he was asked to recite it at the rally. The words were artistically presented giving a vivid description of both the atmosphere and the characters involved at the Semele massacre. Both poems served as a nice closing to the day’s program. The United Assyrian Organizations of Canada wished to thank all participants who helped made this rally a true success. In true Assyrian tradition the program ended with the patriotic Ashur Bet Sargis song “Roosh Jwanqa”. This was sung by local Canadian Assyrian singers Ramis Bet-Shmuel, Talal Graish, Michael George. Also singing with them was our distinguished guest, Shlimon Bet-Shmuel. 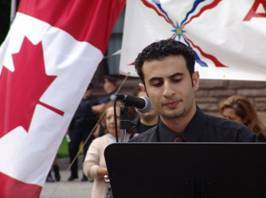 Both Assyrian and Canadian flags began to wave as children all gathered in the centre to show their pride in front of the TV cameras. The positive reactions from members of the audience were reward enough for all those who organized and participated in this rally. The following is a quote e-mailed to the organizers of the event: “ …I believe that there are none amongst us, younger or older, who didn’t feel that lump in their throats when they saw the buses coming in from everywhere, filled with our people and decorated with our flags, coming to unite in commemoration and support. (ZNDA: Baghdad) After much bitter wrangling the 1,300 delegates at the Iraqi National Conference, held for four days this week, finally agreed on a slate of government-backed candidates that forms the 100-member Iraqi National Council. The council will oversee the progress of the interim government until elections to be held early next year. It will also have power to veto legislation with a two-thirds majority and approve the 2005 government budget. The delegates at the Iraqi National Conference elected (81) members to the Iraqi Interim Parliament. Nineteen members were selected early from among the dissolved Iraqi Governing Council, bringing the total number of members of the Iraqi National Council to 100. During the deliberations this week, Masoud Barzani's Kurdistan Democratic Party caused bitter discussions and dismay as it exerted strong pressure on the Conference participants to elect their candidates for the 81 open spots in the Council. The KDP insisted on assigning seats to the Shabak, Turkomen, Arab tribal sheikhs, and Chaldo-Assyrians of their own choice. This Kurdish group, founded in 1945, is led by Masoud Barzani. The group controls the western half of north Iraq, and has traditionally formed alliances with regional neighbors, including Syria, Iran, and Turkey. Since the overthrow of Saddam Hussein, its relations with Turkey have soured, primarily over control of Kirkuk, an oil-rich city in Northern Iraq (both the KDP and Turkey lay claim to the city). The KDP controls some of the armed Kurdish peshmerga forces, which participated in the overthrow of Saddam Hussein and are estimated to have as many as 100,000 fighters. Barzani and other leaders have called for a federal system in Iraq that would grant autonomy to the Kurds. The other Kurdish group, is the Patriotic Union of Kurdistan or PUK, headed by Jalal Talabani. It was formed in 1975 as an offshoot of the KDP. The PUK controls the eastern half of northern Iraq, and receives support from Syria, Libya, and possibly Iran. The group has set up an independent parliament, and its prime minister, Barham Salih, serves as deputy prime minster for national security in the interim Iraqi government. The PUK is generally in favor of reuniting the northern Kurdish regions, but its wary relationship with the KDP has prevented this from happening. Both groups, however, support a federal government that would grant autonomy to the Kurdish regions. As with the KDP, the PUK controls a large peshmerga force. Certain Arab leaders, many Turkomen, Shabak, and Assyrian (Chaldo-Assyrians), protested against the unfair actions of the KDP at this week's Conference. In the end the KDP failed to place their choices from the Assyrian Church of the East and the Chaldean Catholic Church in the Iraqi National Council..
3. Ms. Ibtisam Giwargis Bihnam (member of the Syriac Orthodox Church, head of the Free Women Union and a former member of the Patriotic Party of Bet-Nahrain "Dowranaye"
According to information received at Zinda Magazine, the Yezidis of Iraq have one person representation, the Mandeans, one; the Turkomen, eight; and the Kurds, twenty representatives in the new Iraqi National Council. From left: Fr. Fredrick Hermez (holding a sign) of the Assyrian Church of the East, Fr. Benyamin Gewargis of the Ancient Church of the East, and Fr. Poulas Khazeran of the Chaldean Catholic Church (photo courtesy of Fred Rustam). (ZNDA: Phoenix) On Sunday, 8 August, with temperatures above 110 degrees, more than 200 members of the Assyrian communities in Arizona staged a demonstration in downtown Phoenix to express their anger and concern over the attacks against the Christian churches in Baghdad and Mosul on 1 August. 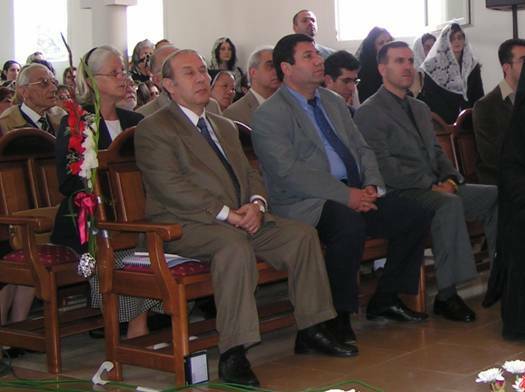 The participants represented the three Chaldean-Assyrian churches (see above photo) and the following organizations in Arizona: the Assyrian American Association of Arizona, Mar Zia Assyrian Organization, Assyrians for Justice, the Assyrian Democratic Movement- Arizona Chapter and the Assyrian Aid Society of America, AZ Chapter. Throughout the day various media outlets covered this event. A petition addressed to President George W. Bush was circulated and signed by more than 600 persons. The petition called for providing immediate protection of the churches, individuals and institutions in Iraq. The Iraqi Conference has chosen among its 100 members four Assyrian Christians. Hekmat Hakim, Wishdan Mikhael, Tisan Giwargis and Yonadan Kanna. Although the Assyrian Christians population of 2.5 million according to the previous government are the indigenous people of Iraq and should be given 10 seats out of the 100 total according to their population as well as their indigenous status they were only given four. Hekmat Hakim was a member of the Constitutional Committee under the Iraqi Governing Council and is a well known lawyer, Mr. Yonadam Kanna is a former member of the Iraqi Governing Council and the leader of the Assyrian Democratic Movement, Wishdan Mikhael is a member of the Constitutional Monarchy Movement and Tisan Giwargis represents the Patriotic Movement of Bet Nahrain. Assyrian Christian Representative, Adam Gewargis who asked that his name be changed in reviewing the list commented " While we are happy that four people from our community were chosen who we are relatively comfortable with, we are deeply angered by the failure to provide our community with the proper representation and are demanding the additional six names which we are due." The Assyrian Christians are the indigenous people of Iraq and are the people of Nineveh of Biblical fame in the story of Jonah. They go on to become the first nation to accept Christianity and become the greatest missionary sending people in history. With the rise of islam and the forced conversion of many of the population - up to 60 % of Iraq is believed by experts to have been formerly Christian - and migration under intense pressure and persecution their number have dwindled to approximately 2.5 million within the country and about 3 million outside the country although figures as high as 80 million when those who were forcibly converted are figured in. Gewargis continues "We are calling on the international community to protest this failure to properly represent our community and in particular to enforce on the ground article 53 of the Iraqi Constitution which provides the Assyrian Christians with autonomy in our homeland. Five months after the announcement of the constitution and over a month after the inauguration of the new government we still have not been able to enforce this provision of the law. Recent events should make clear to any outside observer that the only hope for our people is an area of our own." 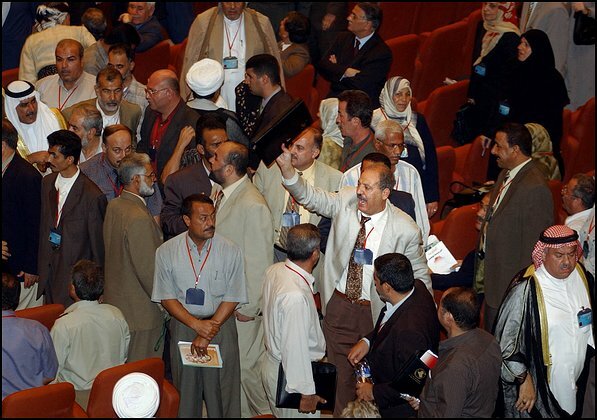 While the Iraqi National Conference produced mixed results with the controversy with a delegation sent to Najef and general chaos, there was a collective sigh of relief that it was able to conclude relatively calmly and that the 100 member committee was able to be chosen with a minimum of controversy. For Iraq under its present circumstances it was a major accomplishment and another feather in the cap of the Alawi administration struggling to keep the ship afloat. Those of us who were against the war on Iraq, were in the minority, we were called names and shunned. We did not oppose war because we thought Saddam was good. We were against the war because we had learned something from History. Christians in Iraq were killed under the the British watch and now under the American watch. Great Powers of yesterday (England, France, etc) did not care about Christians in Iraq nor does today's great power United States. 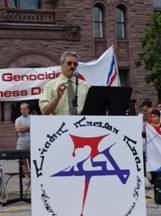 I read Mr. Ashur Simon Malek’s report “Assyrian Remembrence Day in Canada” in last week's issue of Zinda and with sadness I must state it contained misrepresentation, false information and outright lies. First and foremost I don’t believe that this article is written by Mr. Malek as I know Mr. Malek personally, as such I contacted Mr. David Oraha, the president of ACLC, and he denied having anything to do with this article and Mr. Oraha stated that although he was not happy with the article he viewed it a the personal opinion of Mr. Malek. Last week while co-hosting a radio program with Mr. Malek it became apparent to me that Mr. Malek is a member or strong supporter of Bet-Nahrain Democratic Party and perhaps strongly influenced by Mr. Sargon Dadeshoo, and has a strong opposition to the Assyrian Democratic Movement. Although I've known Mr. Malek for many years and consider him a friend, this fact was hidden from me untill it became apparent that he attempted to deceive me by luring me to be a co-host to a radio program which Mr. Malek is the host of in which Mr. Malek advocates Mr. Dadeshoo’s nationalism and AssyriaSat. Mr. Malek became irate when I expressed my opinions that Mr. Dadeshoo is causing damage to the Assyrian National Movement, and replied by attacking A.D.M. There were two events organized in remembrance of the martyrs of our nation, the first being a demonstration and rally at Queens Park in Toronto and the second being the rally at Humber College in North York. 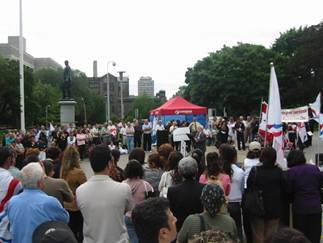 The first event (Queens Park) was organized and hosted by thirteen Assyrian and Chaldean organizations and I use the two terms to denote in my belief to the one and same nation. Through hard work of the representatives of these organizations the event was an overwhelming success. The youth, more particularly University Students, were instrumental in making the event successful. The organizations’ representatives met on a weekly basis for over two months prior to the event and made all necessary arrangements for transportation (six buses from and to six pick-up points), security, set up at the location, and local media coverage. Over 600 Assyrians attended and hundreds of non-Assyrians passed through, taking photos and asking question of the organizers. Parts of the event were televised three times on City T.V. (the main television station in Toronto and the cities surrounding Toronto). There was no planned promotion of the name ChaldoAssyrian as Mr. Malek suggests and each speaker was free to use any name he/she accepted to be that of our nation, and most referred to our nation as the Assyrian Nation. As they say, a picture is worth a thousand words, please visit http://www.assyrianvoice.net/rally/index.htm and http://www.ankawa.com/cgi-bin/ikonboard/topic.cgi?forum=4&topic=1464. It is worth noting at this point that the second event was announced and promoted during the first event and the organizers of the first event suggested to those present to proceed to Humber College following the conclusion of the demonstration. The second event which was a Rally organized by two organizations, ACLC and UAYC was held at the auditorium of Humber College. The A.C.L.C. is a strong opposition to any use of any name for our nation and refuses to cooperate with any organization which does not conform with this stand. That was the reason why ACLC refused to join the thirteen organizations. I do not know why UAYC did not join the thirteen organizations but many members of UAYC were present at the demonstration. 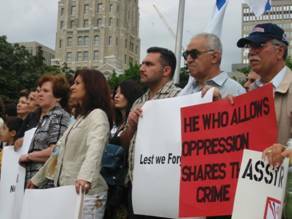 The rally at Humber College was informative and approximately 100 persons attended and among those present were a few Armenians. The Synod of the Church of the East will be held in Chicago next week between August 23-31. We are always told that what makes the church is not its buildings and fixtures, rather its congregation. If so, how much say does the congregation have in the decision-making process regarding the important issues dealing with the church, of which they are the nuclei? We know that there are church committees involved in certain matters of the Church; however, their participation in the decision-making process for the most important issues should be further incorporated. The Holy Synod is a very important gathering of the bishops to address issues that affect the Church. It is here where new policies, regulations, and decisions are instituted. If so, how much is the opinion of the congregation considered when the bishops discuss these various topics? We have entered the 21st century and with that I believe it is vital to take some steps to change some of the church's old custom and habits. For the survival of the church and its development, the congregation must believe strongly in its strong bond and association to church and this can by giving the members a sense of ownership and direct participation in the decision-making. The Holy Synod should not be alien to the congregation. Therefore, I suggest that this Synod consider addressing this issue. I suggest that the future Synods devote or single out the first day of the synod as an open forum that can be attended by the bishops and selected lay and notables from every community where the church exists throughout the world. In other words, the first day of the Synod would be dedicated to listening to the congregation, discuss their concerns, and noting their recommendations. Then the Synod can have the other six days to discuss everything that transpired in that first day and go over their usual agenda. Was it Just A Personal Opinion? I had the chance to watch on Ashur TV the interview with His Grace Mar Bawai Soro. I agree with his philosophy on all issues which were discussed. The only issue which makes me bit confused is: Is it the position of the Assyrian Church of the East (new calendar) to accept the "Assyrio-chaldeans" name? Or is it just the personal view of Mar Bawai Soro?. I hope that the leader (s) of the church makes this position clear..! Assyrian National Council of Illinois proudly presents a public lecture by His Grace Bishop Mar Bawai Soro on Sunday, August 22, 2004 at 6:00 PM (Chicago Time). The lecture will be held at the ChaldoAssyrian Community Center located on 9131 Niles Center Road in Skokie. Admission is free to public and refreshments will be serve. Christians Shut Out of National Conference in Baghdad as Stream of Refugees number 40,000! In a series of moves that do not bode well for the future of democracy and the rule of law in Iraq a series of maneuvers at the Iraqi National Conference in Baghdad have undermined the voice of the Assyrian Christians, who according to figures of the previous government comprise 2.5 Million or over ten percent of the country. According to sources within the conference who asked not to be named, out of the total of 1,000 delegates only 54 Assyrian Christians were allowed to attend and in backdoor maneuvering a total of only three out of the 100 Delegates to be chosen are being allowed. 100 Assyrian Christian delegates should have been allowed to the conference and 10 for the National Committee. "We call up on the democratic countries of the world to insist that the Assyrian Christians, as the indigenous people of Iraq be set aside 10 out of the 100 members of the National Council and that these members be chosen from our own community, not imposed from outside." The Assyrian Christians, are the indigenous people of Iraq, a population that according to some experts nearly 60% of the current Iraqi population are former Christians. The people of "Nineveh", of the Biblical story of Jonah and the whale, the Assyrian Christians play prominent roles in Church History becoming the first nation to accept Christianity and according to Kenneth Scott LaTourette in "A History of Christianity" the largest missionary sending people in Christian History. Sources close to the conference, in particular single out The Kurdish Regional Government who in violation of Article 53 of the Iraqi Constitution have not provided for local autonomy for the Assyrian Christian Community in Northern Iraq. Article 53 provides the Assyrian Christian with their local administrative rights in their original homeland in Northern Iraq, but they have not been able to enforce the law. Apparently, strong pressure is being brought to reduce the numbers of Assyrian Christian representatives from the 10 to three and those members being appointed not by the community but by the Kurdish Regional Government. The state of the Assyrian Christians has taken a sudden turn for the worse in recent days with the announcement by the Iraqi Minister of Migration, Pascale Isho Warda, the only Assyrian Christian in the Iraqi Government, that "The number of Christians who have left Iraq has reached 40,000 according to the latest statistics. This emigration is due to insecurity and the attacks on the Churches in Baghdad and Mosul two weeks ago." According to Assyrian Christian activist William Yonan, who asked that his name be changed for fear of reprisal "We urgently need help! There is a calculated campaign to cause our people, the original people of Iraq to leave. There are those who hate Christians, simply because of our faith and because of the simple fact that we represent the voice of reason and normalcy. The vast majority of the Iraqi people do not want the dark forces to rule in Iraq and are fighting valiantly to prevent their takeover. It is the Assyrian Christians who are at the forefront of this fight defending the Iraqi people who are for the most part completely secular against the mullahs and other dark forces who want to turn Iraq into another Iran." An Assyrian Christian website Assyrianchristians.com posts pictures of recent killings as well as a plan for the enforcement of Article 53 on the ground in Iraq. Yonan continues "It should now be clear to the world that the only way for the Assyrian Christians to survive in Iraq is to be accorded our rights under Article 53 for our homeland in historic Assyria. We call upon the democratic countries of the world to demand that the Iraqi constitution be honored and our land be returned to us so we can live in safety and honor as guaranteed by the Constitution." A recent report by the European Union stated that "little or no aid is being received by the Assyrian Christians in Iraq. International aid is mainly distributed through regional and therefore moslem leaders and seldom or never reaches the Assyrians." The population of Christians in the Middle East as a whole has gone from nearly 20% a generation ago to now under 2%. Reports tell of a conference held in 1980 in Lahore, Pakistan in which regional representatives vowed to climate all Christians from the Middle East. As the numbers drop below 2% and with this most recent exodus from Iraq their goal is more and more a reality. "Not even the thousand years of Greek rule under Seleucide, Romans, and Byzantium were able to annihilate Aramaic as a language and Assyrian cultural identity from the Near East... The essential thing is that the Assyrians still preserve their ethnic, cultural and linguistic identity in spite of their loss of political power and heavy persecutions they have experienced especially in the Christian era." 'Assyrians After Assyria', Professor Simo Parpola, Dept of Assyriology, Helsinki University. The previous language of the Assyrians and the Babylonians was Assyro-Babylonian (Akkadian), notorious for being a difficult language but well-known for being a 'cultured language'. It was the first Semitic language, and it was written in cuneiform and was spoken for nearly 3000 years in Mesopotamia ---- from around 3500 to 600 BC; it became extinct about 200 BC. It was around 800 BC that Aramaic language began its 'linguistic migration' from Aramea to Assyria. Indeed, Aramaic was the indigenous language of the Arameans. The Kingdom of Aramea, which consisted of something like forty tribes, was adjacent to Assyria(Assyrian Empire). The spreading of the Aramaic language in Assyria was taking place very rapidly, permeating into Assyrian social strata.This linguistic spreading was so successful that in twenty years time Aramaic was officially accepted as the second language of Assyria. Encyclopedia Britannica says, " By the eight century BC it[Aramaic language] became accepted by the Assyrians as the second language." (This was in my view about 770BC.) Aramaic continued its spreading successfully, in fact so much so that before 750 BC it supplanted the Akkadian language, thus giving an end to the 'linguistic rivalry' that was going on between Akkadian and Aramaic. Indeed, Aramaic became the official, the first, language of the Assyrians and the Assyrian Empire. Not immediately(as most scholars in this field think), but after two or three decades Aramaic began also spreading out over Babylonia, the 'sister' of Assyria. It did not supplant the Akkadian language in Babylon quickly; this took place most probably not before 650BC(say, between 650 and 640 BC). became the second language of Sumerian people and then, over a period of time, it supplanted their language. Sumerian dates back 7000 years. This ancient People, without any doubt, left some of her cultural influence in Mesopotamia. From 600 BC Aramaic began to spread out beyond the boundaries of Mesopotamia. The whole process of this ' linguistic migration ' was so fast that a century later Aramaic became the ' lingua franca ' of most ( nearly all ) Middle Eastern countries. This ' first lingua franca in the world' was also welcomed in some other parts of the world. The most welcoming nation to this "amazing language" was probably the Persian Nation and its great Empire. Encyclopedia Britannica says, "....It[Aramaic} subsequently became the official language of Achaemian Persian dynasty ( 550 - 330 )'. Aramaic enjoyed its status as lingua franca for more than a thousand years. The "ubiquitous status" of this extraordinary language began diminishing in the late 8th century A.D, and such diminution was in direct proportion to the speed of its being replaced with Arabic language. I have referred to Aramaic as 'amazing language', and in doing so I have not indulged in exaggeration--------I simply meant what I said. This precious language, Leeshana Aramayah, is amazing in many ways; it is a very special language. It includes elegant idiomatic expressions, rich metaphors and similes, meaningful paradoxes, amusing hyperbole, profound parables, and so on------but! But there is something even more than these that renders Aramaic unique among all the languages in the world. And that is the 'higher dimensional aspect' of it------something of a Spiritual Dimension. Aramaic is a 'mystical' language, and in certain aspects it is completely different from other languages. It is a language of the Soul/Mind..
expresses the manner in which the mind functions." Absolutely true! It could be said that it is the language of 'Here and Now'. In Aramaic the 'divisions' between Past, Present, and Future are not 'thick concrete walls' as they are in other languages. Furthermore, Subject and Object in Aramaic are on the same 'spectrum', and Objective and Subjective are not the 'opposites' but on the same 'continuum'. It is the Language of Eternity-----"I Am". Is it any wonder then why Western Aramaic scholars have never been able to grasp ( fully understand ) this "Spiritual Beauty" ( this ' non-physical' aspect) of the Aramaic language? Now we can see why the late Doctor George Lamsa, an Assyrian, had by far a deeper knowledge of Aramaic and particularly a more profound insight into Aramaic Bible( and biblical Scriptures as a whole) than all the Western Aramaic scholars put together. That is why most of them did not like him and many of them could not stand him, and even now(after his death) some of them have not stopped slogging him off. And it wasn't only because of these that Lamsa was disliked by these 'Quasi-Scholars' in the West. They could not stand him mainly for his spiritually adventurous nature, his extraordinary courage, and his straightforwardness in revealing "The Truth" about The Bible-----that Bible was originally written in the Language Spoken by Eshoo Msheekha (Jesus Christ)--- the Aramaic language. On the translation of the Bibles(Old and New Testaments), Lamsa spent more than twenty five years. In his books, articles, and lectures, Lamsa always maintained that Aramaic Bibles are superior sources of Biblical truth than Latin or Greek based Texts. His writings are illuminating and his explanations are elucidating. He was a true Scholar and a truly learned man. He spoke at least eight languages. Often in his writings Lamsa refers to Aramaic as " The language of the Assyrians ", and also sometimes as " The language of the Church of the East". Western scholars did not like this kind of statements. As far as The West is concerned The Assyrians ' vanished ' from the face of Earth in 612 BC, when their Empire fell. Being part and parcel of the Western world, these scholars hardly(in fact most of them never) in their writings mention the word 'Assyrians' who are the heirs to the very language of which they claim to be the scholars. I wonder if they realize how great has been the contribution made by the Assyrians in terms of both amount and quality to the Aramaic language and literature. And the Missionary Enterprise of the Assyrians under the 'umbrella' of the Church of the East ( Also known as The Assyrian Church ) still remains unparalleled in spreading Christianity in the World. Furthermore, these inherently cultured people of Mesopotamia, the Assyrians, together with the Babylonians, built, what is known as, " The Cradle of Civilization ". Assyrians love their language; they think of it as their ' highly important cultural identity', and also as the "Connecting Link" between them, as a People, and their Saviour. And that is why they have taken 'Good Care' of it. As the heirs to this precious language they have looked after it and their Scholars have developed it linguistically and enriched it philologically. Such enrichment also includes the suffusion of many Akkadian words in Aramaic language and literature. The mention of 'Aramaic literature' reminds me to say that more than two-third (at least 70 percent) of the treasure of Aramaic literature available today is the product of the literary works of the Assyrian writers, including some of their eminent scholars; and of course the theologians of the Church (The Ancient Apostolic Church of the East whose present Patriarch is the 120th on the Line of Succession ) have contributed enormously to the treasure of Aramaic language. Later, the city that became the place for the development of Aramaic was Edessa ( in Assyrian/Aramaic called 'Urhai' and today is part of Turkey, referred to as 'Urfa' ).Edessa was renowned for being the cultural and intellectual center of the Assyrians. I love to talk about Edessa and also to tell the story of Jesus and king Abgar of Edessa, and the exchange of the letters between them, but this is not the place for it. Anyhow, Assyrian scholars and intellectuals and their Church ( the Church of the East) in the 5th century had to move from (in fact they were ordered to get out of) Edessa which was at the time part of the Roman Empire. They moved to Nisibin which was another cultural city of the Assyrians.This city was part of Persian Empire. It was here, in Nisibin, that the Assyrians established The First University in the World. The University consisted of several Faculties: Philosophy, Theology, Literature and Philology, Science, and Mathematics'. At this stage the Aramaic language and literature were flourishing. And what about the priceless treasure of the Aramaic literature available today? Paul Younan, an Aramaic scholar and the translator (interlinear translation) of the New Testament from Peshitta Aramaic into English, in his interesting and informative Paper, ' The Preservation and the Advancement of Aramaic Language in the age of Internet', says, "Aramaic language encompasses a treasure of nearly 3000 years of Assyrian civilization including our versions of the Bible( The Peshitta Aramaic ), hymns and poems, translations of Greek works, biblical commentaries, historical works, compilations of lives of Saints, and works on Philosophy, Grammar, Medicine and Science." Who knows? Perhaps the Assyrians ' were meant' to Pave The Way philologically) for The Coming of The Lord and Saviour! And who knows Perhaps the Aramaic Language ' was meant' to be the Language of the Teaching and Preaching of The Christ of The Living God. Indeed, the treasure of Aramaic language is priceless. And it has also been priceless in enriching other languages' literature. Assyrian Aramaic became for centuries the 'source of enrichment' for the Greek theological and philosophical works. Furthermore, to a large extent Greek language stemmed from Aramaic. And again to a large extent, both Hebrew and Arabic languages owe their development to Aramaic language. In fact the Hebrew alphabet is derived from (base on) the Aramaic alphabet; and this applies to many other languages too. In the same Paper, Paul Younan says: "Aramaic was the first lingua franca. It also served as a basis for almost every Western-based alphabet in existence, from Greek to English and from Hebrew to Arabic." Today there are nearly(if not quite) twenty variants of Aramaic language, which are referred to by some students of Aramaic as 'languages'. This makes nonsense of what is meant by ' language'; they are not languages. Nor are they all (as most scholars say) 'dialects'. Some of them are dialects, and some of them are ' Versions ' in the true sense ( Forms of Aramaic ). They all of course come under the 'umbrella' of Aramaic language. Until about 250 BC there was one Aramaic, the Assyrian Aramaic. At the time of Jesus apart from this original Aramaic there were two (perhaps three?) variants of this language, one of which was Hebrew Aramaic. The real diversification of Aramaic took place from around 1000 to 1500 AD. Only one or perhaps two of the variants of Aramaic available today are Western Aramaic, the rest are all Eastern. the Holy Apostolic and Catholic Church of the East, we wish to state that the Church of the East received the Scriptures from the hands of the blessed Apostles themselves in the original language spoken by Our Lord Jesus Christ Him self and that Peshitta [Peshitta Aramaic] is the Text of that Church which has come down from the biblical times without any change or revision. Pauline Epistles as some Western scholars say; they were written years before those Epistles." Assyrians, as a People, were the first to believe in Jesus as the Lord and Saviour. After the Assyrians, in my view, it was the Chaldeans who followed Jesus. However, Victor Alexander slightly differs from this view. He says: " "The Ashurai Nation [Assyrian Nation] became Christian in the first century, followed by the Armenians and Chaldeans." This Church, the Church of the East, today is usually referred to as the Assyrian Church of the East. The Patriarch and The Head of the Church is His Holiness Mar Dinkha. The rituals and the liturgy of the Church are carried out in the spiritually rich and beautiful version of Aramaic that Our Saviour spoke and also used for His Teaching and Preaching, The Master was the master of both the use and the usage of the words in Aramaic Language. It is only in Aramaic language that The Lord's Prayer rhymes, and it is only in Aramaic Bible (only in Aramaic language, and in no other language in the world) that The Beatitudes, Sermon on The Mount, rhyme. In fact there are hundreds of poetical verses in Aramaic. Such rhyming, rhythmic beauty and poetical skill and word-play in Aramaic New Testament can not be translated into any other language. Now we can see why this 'philological beauty' is absent in Greek bible, which is a 'messy translation' of the Aramaic Bible. Greek...Jesus and his disciples not only could not speak Greek but they never heard it spoken." And let me say here that without the civilization of Mesopotamia there wouldn't be Greek (and also to a large extent Persian) civilization. Particularly, Greeks owe a great deal of their civilization to the Assyrians from whom they learned almost everything. Every Assyriologist and every Scholar of the Ancient History will attest this. The eminent Assyriologist of Helsinki University, Simo Parpola, in his well-known Paper, 'Assyrians After Assyria' says: "We know that Greeks and Romans from Plato till antiquities kept learning spirituality and science from the Assyrians and the Babylonians." Yes indeed, also the Romans and the Roman Empire learned, and learned a great deal, from the Assyrians and Babylonians.
" Jesus spoke Galilean dialect of Aramaic." " Jesus spoke Aramaic with Galilean accent." " Jesus spoke Galilean Aramaic." The three above statements denote the same thing: Jesus spoke the Aramaic that was spoken in the Galilee, which was a region, province, in Palestine. Let us know more about this ' Special Region ' of Palestine. And who can describe it better than the man himself, Doctor G. Lamsa? Messianic promises, and they prayed with vehement supplications for the deliverance of their lands from the pagan rulers." In Palestine, at the time, there were only ' a couple of ' variants of Aramaic, and the best (the richest) one was spoken by Galilean people. Nazareth was a town in Galilee. Jesus was from this town---hence, Jesus of Nazareth. Galileans, originally, were Ashurayeh (Assyrians) who centuries before had moved, immigrated, to that region of Palestine. This has been attested by a number of scholars including Victor Alexander and the late George Lamsa. Victor Alexander, who has translated the New Testament from Aramaic into English(and he is busy translating the Old Testament too), says that not only were the Galileans Ashurayeh, but also their language, Galilean Aramaic, is the key to the Scriptures, or as he puts it ' to the translation of the Bible'. Let us see what he says. was the Capital of Ashur[Assyria]. Ashurai [Assyrian] language in the Galilean dialect is the key to the translation of the Bible." At the same time we have many biblical scholars particularly 'Aramaic Primacists' who maintain that the version called 'Peshitta Aramaic' (which is the official, the Holy, Text of the Apostolic Church of the East), was the language of Jesus and His Disciples, and it is The Key to the Scriptures. In fact this was emphasized (more than once) by His Holiness the late Mar Shimoon, The Patriarch of the Holy Church of the East (the one before the present Patriarch), who was also an eminent Scholar of The Bible and the Aramaic language; I have already quoted from Him. From what has been said I draw my own conclusion which in part is implicit in what has been said. As I see it both Peshitta Aramaic and Galilean Aramaic were Aramayah d'Ashurayeh, Assyrian Aramaic, but with a difference. The difference is this: Peshitta Aramaic is the Special Version ( the Literary Form ) and the Galilean Aramaic refers to the Common Speech( the vernacular) of Aramayah d'Ashurayeh. Put another way, Galilian was the 'Colloquilism' of Peshitta. Isn't it the ' greatest Blessing ' for a people or nation to be Pronounced 'repented' by Jesus Christ? according to most Jewish scholars." Such usage of the two words, 'Ashurai and Aramaic' (using them interchangeably) is a reminder of the ancient Assyrians and of the ancient Aramaic, and also of the Ashurayeh and their language at the time of our Lord in Palestine. Apart from the Assyrians there are in the Middle East a few other communities, including the Chaldeans, who speak Aramaic language, and also in their Churches the liturgies and rituals are carried out in this language. These people speak in different versions/dialects which are called (by aramaic pundits), ' Modern aramaic' or ' Neo-aramaic'. Languages, in the course of time, change as a ' linguistic evolutionary process'. However, considering the vicissitudes, over the centuries and centuries, that the Aramaic speaking people, particularly the Assyrians, have been through, we can boldly say that it is a ' Not-Much-Changed' language---Still Spiritually Rich Aramaic! Incidentally, the Chaldeans of today most (if not all) of them are the Assyrians who are the followers of the Roman Catholic Church. Let me tell a long story in a few lines only. In 1550s AD a number of Assyrians headed by a monk by the name of Sulaqa broke away from the Church of the East. Sulaqa together with his 'entourage' went to Rome and visited the Pope. He was warmly welcomed and was gladly appointed the Patriarch of the new Uniate by the Pope, Julias the third, who also designated the new Church ' the Chaldean Church' in order to have it distinguished, separated, from the Assyrian Church of the East. Thus, all the Assyrian followers of Sulaqa betrayed their ecclesiastical identity and denied their national entity; they followed the Church of Rome and called themselves ''Chaldeans'. And even to this day if or when an Assyrian joins Roman Catholic Church he or she (most probably) will call himself or herself "a Chaldean", which is absolutely absurd, and also very sad --- Sad indeed! Today there are over three millions (nearly 3.5 M) Assyrians scattered almost in every corner of the world. Nearly two-third of them are in Iraq, America and Syria, and the rest of them mostly(but not all) are in Europe. These inherently cultured and instinctively courageous people (despite going through the worst kinds of persecutions throughout the centuries, and being Stateless since 612BC, and in spite of having experienced the horror, grief and sorrow of the killings, massacres and the genocides of their brothers and sisters, most of which took place in the 20th century), have dearly preserved their language, and have faithfully kept their Christianity and also their Ancient Church, and have graciously upheld their cultural values and traditional principles. And above all, these great people, Ashurayeh, have never stopped contributing to the well-being of their fellow human beings and to the civilization of the World. Doctor George Lamsa. The Websites that deal with Lamsa and his works (books,etc) are mostly of the Aramaic Bible Society. Doctor W.A.Wigram wrote several books on Assyrians and the Church of the East, and related areas. There is, in this Article, a Quotation from one of his books, ' The Cradle of The Mankind ' which is included in Paul Younan's Website. The Syriac Orthodox Saint Mary Mother of God’s Church, Montfermeil , France consacrated and inaugurated on July 4 th, 2004. The Assyro-Chaldeans, called by France ’s people, “the builder people”, have just inaugurated a new church. 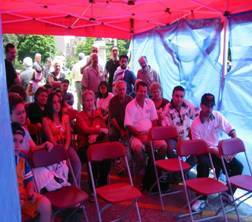 Sunday, July 4 th, 2004, was a great day for the Assyro-Chaldean people of France: a portion of the members of this community celebrated Saint Thomas in the Chaldean church which is dedicated to him (consacrated on February 7th of this year) in Sarcelles, and another group participated in the consecration of a new Syriac Orthodox church in Montfermeil. Within only thirty years of presence in France, our people inaugurated three churches : Notre Dame de Chaldée in Paris (1992), the Saint Thomas Apostle church in Sarcelles (2004) and the new church, Saint Mary Mother of God in Montfermeil (2004). 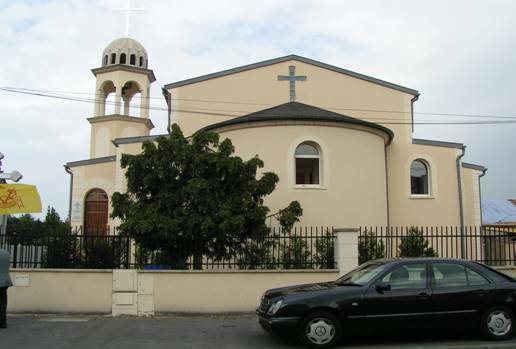 This church was built on the initiative of a Syriac Orthodox priest of the community settled in Clichy-Sous-Bois and in its neighborhood, Qashisho Yakup Aydin. This one made everything for the realization of the prediction of Moran Mor Ignatius Zakka 1st Iwas, who had said ten years ago : "one day, the small herd of France will have its own church". Qashisho Yakup Aydin began with nothing: he realized all the works he could make himself (dig, build, decorate, collect money by very numerous visits in the European countries). When the collected sums were not enough to complete the building works, he did not hesitate to go in various countries or to visit various organizations to gather new capital. 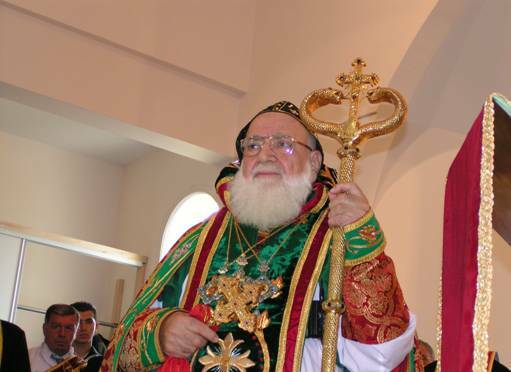 It is for this courage and this dedication that the patriarch decorated him with a very beautiful cross. 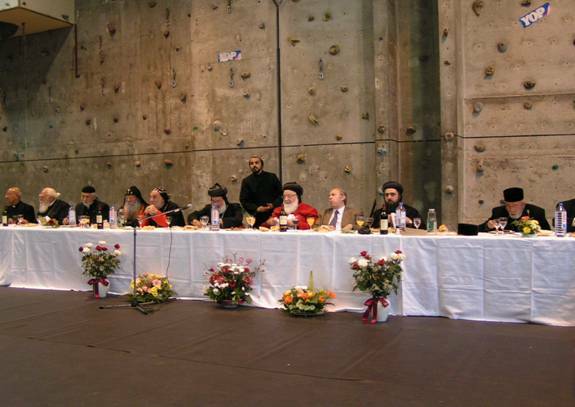 After several years of waiting (quite as the Saint Thomas Apostle church in Sarcelles), the Syriac Orthodox church opened its doors to the Assyro-Chaldean community, of Syriac Orthodox confession, dependent on Moran Mor Zakka Iwas's jurisdiction. 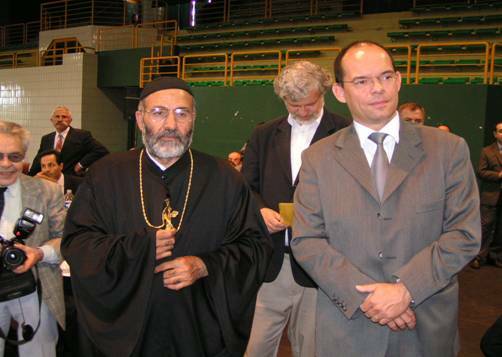 The day of its opening, July 4th, 2004 , about 700 to 800 persons were present: several Assyro-Chaldean delegations came from different European countries ( Sweden , Germany , Holland , Belgium ) participated in this big event with their priests and bishops, notably Mor Julius Jeshu Cicek, Syriac Orthodox Church’s Archbishop of Central Europe. Political, civil and religious personalities did not miss to be present, as the consul of Syria in Belgium, the representative of the Syrian consul in France, the military attaché of the embassy of Syria in France. The municipal people in charge of the city of Montfermeil, among whom the mayor, the people in charge of the various Christian confessions in France (Orthodox, Protestant, Catholic), the leaders of non-governmental organizations as Aide à l’Eglise en Détresse (Help to the Church in Distress) and Oeuvre d’Orient (the Work of East), etc., greeted this community and this beautiful realization. Among the presents, we could count also Mgr. Petrus Yousif, patriarchal vicar of the Chaldean Catholic Church in Paris, who showed, by his readings and his presence, the religious unity between the Chaldean Catholic and the Syriac Orthodox Churches. Besides, Joseph Yacoub, interrogated at the end of the ceremony by the biggest channels of French television covering this event, made the trip between Lyon and Paris not to miss this occasion. Sébastien de Courtois, young researcher and author of a book about the forgotten genocide against our people in 1915, was also present. The Association of the Assyro-Chaldeans of France as well as the Union of the Assyro-Chaldeans of France and the representatives of some Assyro-Chaldean political parties had sent delegations to show their support for the Syriac Orthodox community. The Assyro-Chaldean Voice covered this event. The Assyro-Chaldean community of France, which did not miss to support the project, so morally as materially by donations, was scattered in the church and in its garden, where was placed a huge screen. The absence of the Turkish authorities and the Turkish media, not invited to this celebration, was noticed by this community mainly native of the southeast of Turkey . Indeed, the Assyro-Chaldeans of Syriac Orthodox confession are from the villages of Tour Abdin and its neighborhood. Syria is the second country of origin of the Syriac Orthodox. The Syrian authorities were present and it was a brand of respect to Moran Mor Zakka Iwas, who came from Damascus , specially for the inauguration of the new church. This church could not have been realized if the architects, that Qashisho Yakup Aydin qualified as "the hand of God", had not realized the architectural plans voluntarily. And they managed of the bet to realize a very beautiful church surmounted by a bell tower hidden in a magnificent dome of Syriac tradition. The consecration of the church Saint Mary Mother of God was made by His Holiness Moran Mor Ignatius Zakka 1st Iwas, whose speech was very positive concerning the situation of our people in Syria . At the end of the ceremony, the city hall of Montfermeil had given to the Syriac church all its infrastructures (room, local police, etc.). The patriarch participated in the meal offered in his honor and did not hesitate to bless families, couples and children. The members of our community crowded to be photographed with the patriarch. The meal was offered to about 700 to 800 persons.